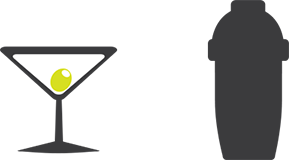 Kobas :: Your complete hospitality management solution | Daily Tasks: Incidents, Paid Outs, and Handovers. This page allows you to note any Accidents, Incidents, Visits, or other noteworthy events that might happen in a shift. The page allows you to select an Incident Type, as well as adding any additional notes. If you have any supporting documents, these can be quickly uploaded by selecting Choose File under Upload Incident Report. Once you have completed your Incidents Log, your weekly log will automatically update. This is accessible through Daily Tasks > Incidents Log and will show logs for all venues by default, which can be filtered down as needed. Please note that Paid Outs can only be attributed to Suppliers listed in Administration > Stock Suppliers. The Paid Outs screen allows you to log any petty cash payments that have been made during your EPoS session. The options that you have to include are the Supplier that was paid, the Total value of cash paid, as well as declaring whether proof of purchase was received. The Notes section allows you to add any further description that may be required. As you can only use recognised suppliers on this page, we recommend creating a supplier named “General Petty Cash” for Paid Outs to persons or businesses other than your usual suppliers. For instance a window cleaner or plumber. For more information on creating a supplier, please see our guide to Orders and Deliveries. 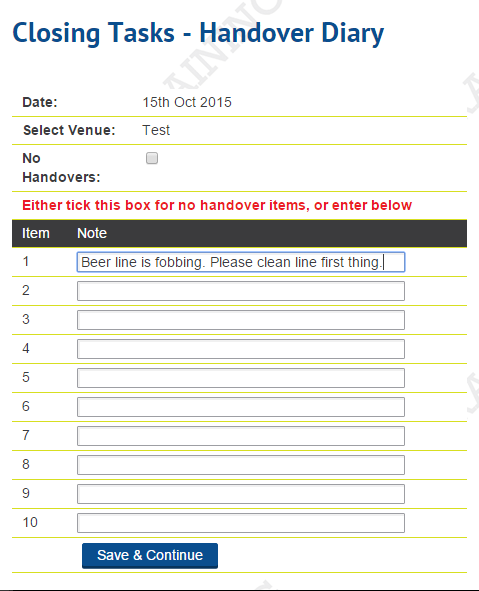 Using the KOBAS Handover Diary removes the need for (dodgy!) handwritten notes and ensures that nothing gets missed. Anything saved in the Handovers section of the Closing Tasks will be added to the Opening Tasks Handover Diary for the next morning.